We are counted amongst the top companies involved in offering a wide range of Top Bottom Hangers. These are available in flexible designs and are very light in weight. Offered products are manufactured using optimum grade plastic and advanced technology as per industry set norms. In addition to this, these are well known in market for their high durability and fine quality. Making use of advanced technology and quality material, we have been able to manufacture and supply an innovative range of Plastic Products. We work as a coordinated team to ensure all the steps of manufacturing & others process are in lieu with the laid down plans. Our clients can avail quality range of Hangers, Pinch Clip Hangers, Small Hangers, Wooden Coat Hangers, Jacket Hangers and Plastic Products. 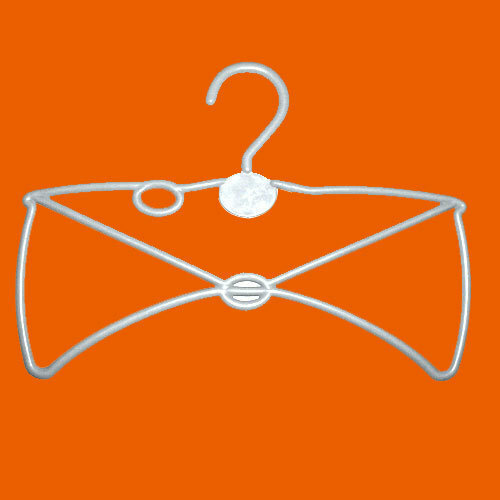 In addition to this, we also offer Suit Hangers, Wooden Saree Hangers, Padded Hangers, Skirt Hangers and Trouser Hangers to the clients. We have been able to cater to a huge base of clients owing to the products featuring durability, lightweight, easy maintenance, re-usability, Eco-friendliness and stylish outlook. At our state-of-the-art manufacturing facility, we manufacture our product range under the vigilance of the experts. This facility is managed by a team of professionals, which makes use of quality approved material. Every end product goes through thorough quality check to ensure that it is designed at par with the national quality standards. With this range, we have been able to cater to the requirements of the clients based across domestic markets.